Q: I live in a county that is quarantined for gypsy moth. Can I ship trees to uninfested counties? A: Not unless you get your crop inspected and certified as being free of all viable gypsy moth life stages from either an Indiana Department of Natural Resources representative or some other plant health regulatory official. Passing that inspection certifies your crop as free of gypsy moth. Q: What can I do to be sure that my crops will be inspected in a timely manner so I can have the best chances for shipping? A: You should contact Megan Abraham at the Indiana Department of Natural Resources (IDNR) (317-232-4120) to obtain and sign a Compliance Agreement (CA). IDNR will also help you assess the gypsy moth threat on your farm. Q: What is a Compliance Agreement? A: A Compliance Agreement is a legal document containing the following stipulations. 1) You will only ship regulated articles that are free of viable gypsy moth life stages. 2) Regulated articles will be inspected annually and treated when viable stages are present in accordance with accepted procedures. 3) United States Department of Agriculture - Plant Protection and Quarantine (USDA-APHIS-PPQ) will furnish inspectors, when available. 4) You will use official certificates and labels to certify that the crop is free. 5) You will use labels only on gypsy-moth-free crops. Contact Megan Abraham at IDNR (317-232-4120) or your local nursery inspector to order labels. Note: Failure to comply with the Compliance Agreement or gypsy moth regulations may result in civil penalty. Q: What does the inspector do when he or she visits my property? 1)	One or more egg masses on the regulated articles or within 10 feet of the articles. 2)	Five or more egg masses per acre within 100 feet of the article. 3)	Heavy larval infestations within one mile of the production area, which could result in infestation through blow in or larval migration into the site. Q: Can I ship trees after the inspector finds gypsy moth? A: It depends on when they find it. When gypsy moths are in the caterpillar stage they can be killed on your crop with approved insecticide sprays. When moths are in the egg stage, each tree to be shipped must be inspected. When egg masses are found they should be removed or treated with a smothering agent called “Golden Natural Oil.” Although methyl bromide treatments are approved to kill gypsy moths on trees, this process is not acceptable because it will ruin your crop. The gypsy moth caterpillar feeding. Q: How do I treat fields infested with gypsy moths? A: Nursery producers and Christmas tree growers need to apply one of three approved insecticides in accordance with label directions. Apply these insecticides on the trees when caterpillars are 1/2 to 1 inch long (about May 10) and again when they are about 1 to 2 inches long (about May 25). The first spray kills caterpillars that are blown in. The second spray kills larger caterpillars that are wandering into the field. In fields near areas that have recently been defoliated, growers should spray an additional application of Dimilin (diflubenzuron) in late April. If at all possible, both Christmas tree growers and nursery producers need to apply diflubenzuron or Bacillus thuringiensis to adjacent woodlots if they are infested with gypsy moth. This will kill young caterpillars that can move into the crop during the month of May. Note: Dimilin is the most effective of the nine materials and has a low impact on non-target species and beneficial insects that help control other pests. This product is recommended for nurseries and Christmas tree plantations with integrated pest management programs. 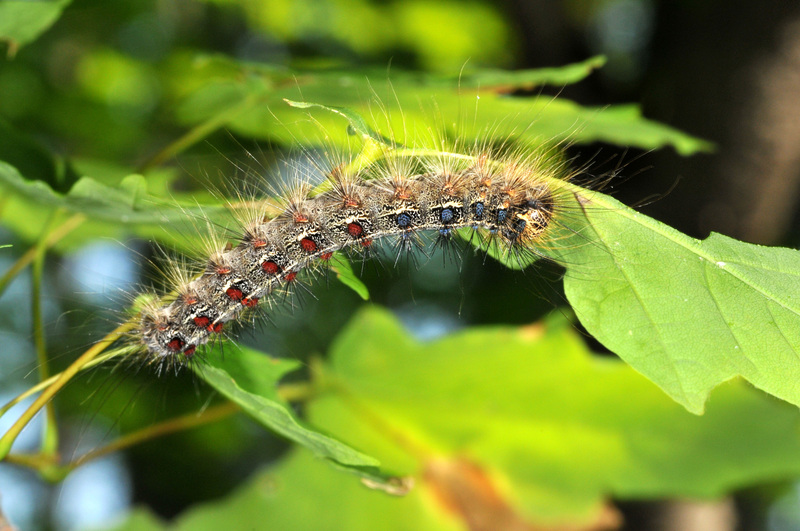 Q: What should I do if my county is quarantined in July after gypsy moth is beyond the caterpillar stage? A: You still need to contact Megan Abraham at IDNR (317-232-4120) to sign up for the Compliance Agreement. At this time inspectors will visit to determine if there are enough gypsy moth in your area to prevent shipment. Since the gypsy moth populations are generally low in newly quarantined counties, it is unlikely that there will be enough moths in your area to cause a problem. However, if your field is near a site that had enough gypsy moth to qualify for aerial treatment in the spring, the gypsy moths may be near enough to your fields to restrict shipment. The only way you will know is to have your area inspected. The best way to do this is by signing a Compliance Agreement. Download and use the Great Lakes Early Detection Network App for Android or iPhone. Contact the Indiana DNR at 866-NO-EXOTIC. Visit Purdue Extension Entomology's Gypsy Moth Information Web Site to download free GM series bulletins and get the latest information. Order the GM series bulletins at your Purdue County Extension office or by calling 765-494-8491. Contact the Department of Entomology, Purdue University, W. Lafayette, IN, 47907-1158, 765-494-5983, or Indiana Department of Natural Resources at 317-232-4120. 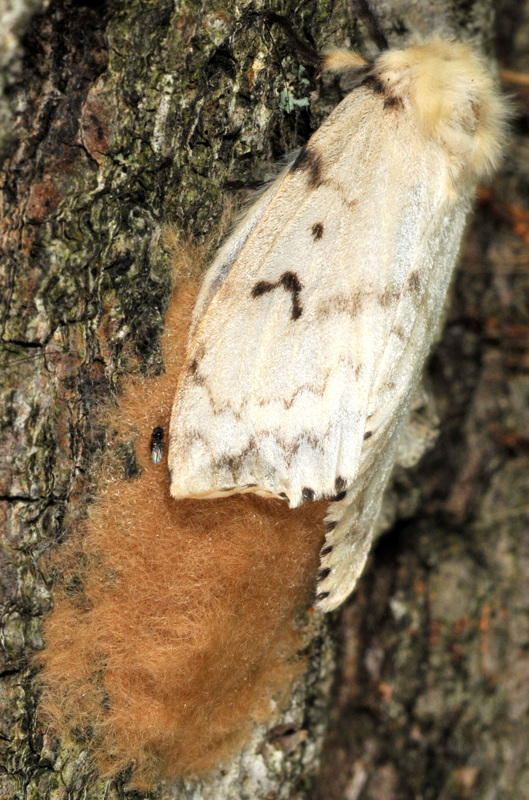 Gypsy moth adult with egg mass.